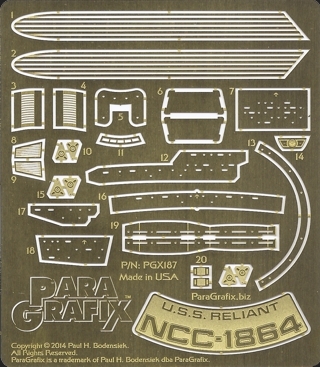 Super detail the 1/1000 scale Reliant kit from Polar Lights with updated and missing details including warp and impulse engine grills, bridge deck airlock, and more. The landing bay doors are updated with sidelights matching the original studio models details. A name badge is included to dress up the kit’s display stand.